So Josephine needed a blanket for her babydoll, and as i had some red heart laying around I quickly set to work making this boring peice, however she loves it so I can’t complain (oh the things we do for neices). 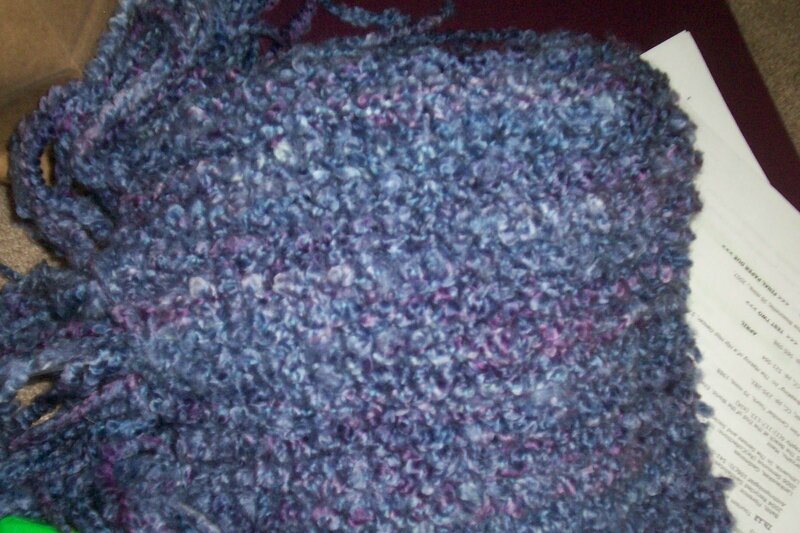 After mom saw my Sunday Market Shawl she wanted one, so here it is unblocked but ready to be. I made it useing her color palette, as we all know I am no wearer of tan. This is the sunday Market shawl that made her want her own. I made it out of some Rowan Linen Print, you can’t really tell it’s greatness but it is truely great. The perfect spring acoutrement. 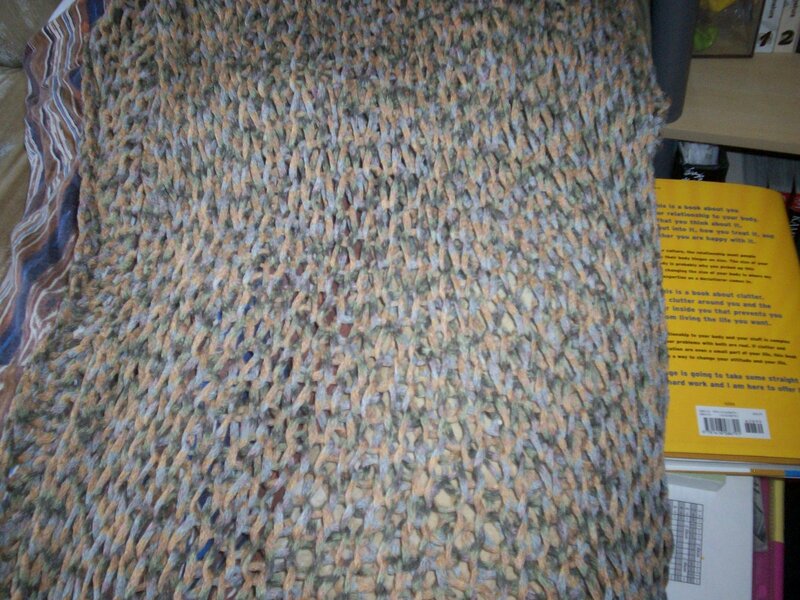 And here is the sweater I started knitting for Lana, it’s out of handspun hand dyed and some moda dea. 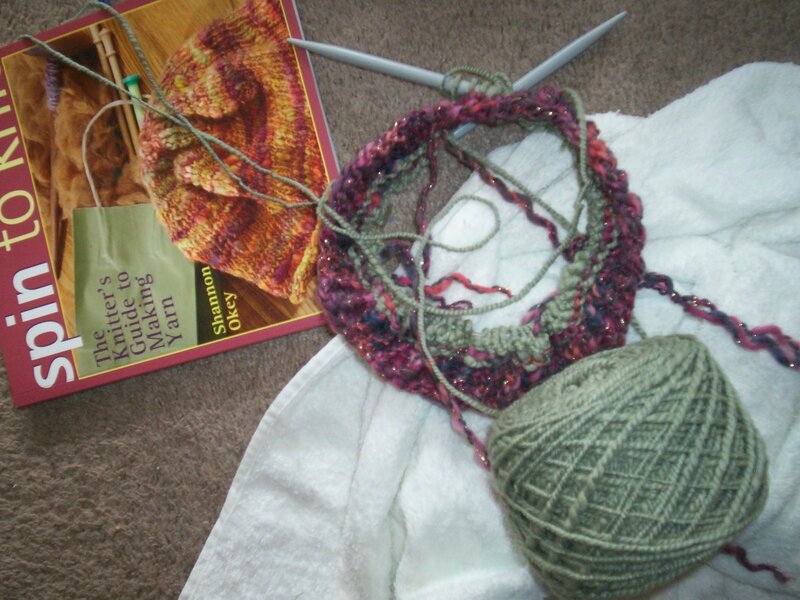 I’m useing the Forsythia sweater from Spin to Knit as the pattern. Hopefully it turns out all good. 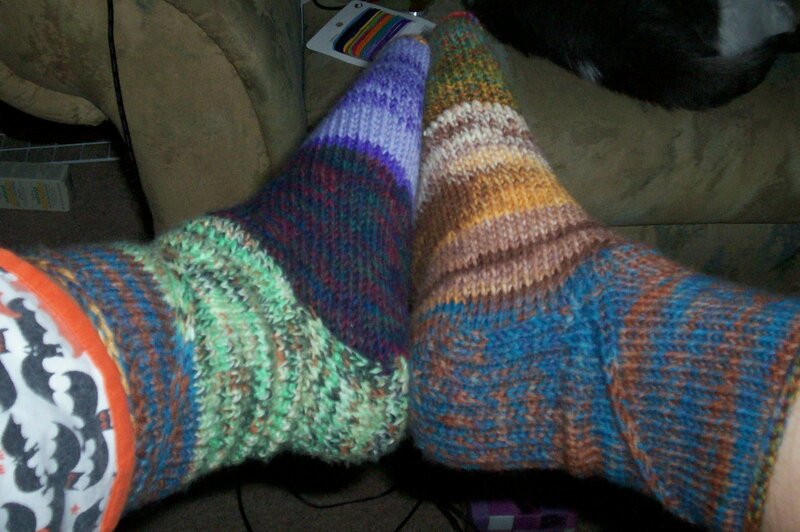 These just came off the needles and I am more than happy. 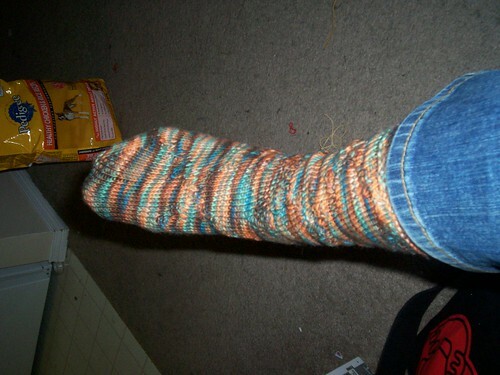 The first one cast off a little tight and needs some easeing to get on and off, but I added a few stitches to the top of the second one and it truely is a pleasureful sock. 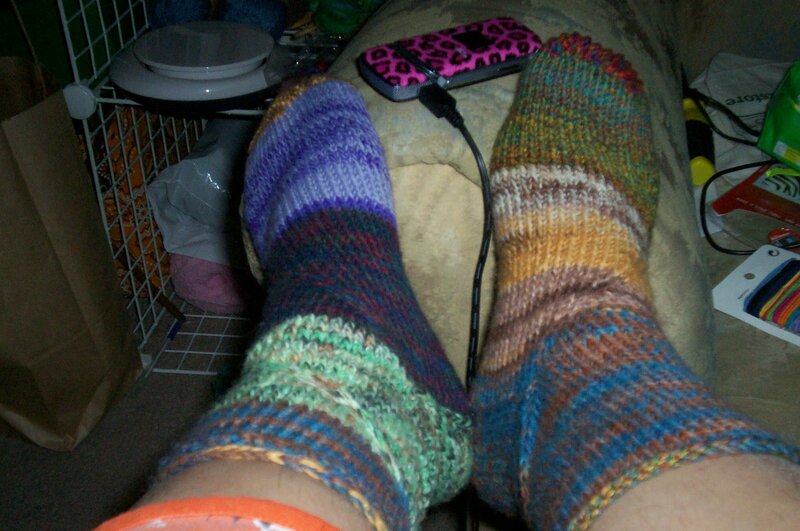 So I fell into total knitterly love with the greatness that is the Lime and Violet podcast, and when i was listening like a rabid fan to all the old episodes I came across the pattern for snakes on a sock. Immediately I cracked out the STR (in cracked canyon) and set to work on a pair for myself. 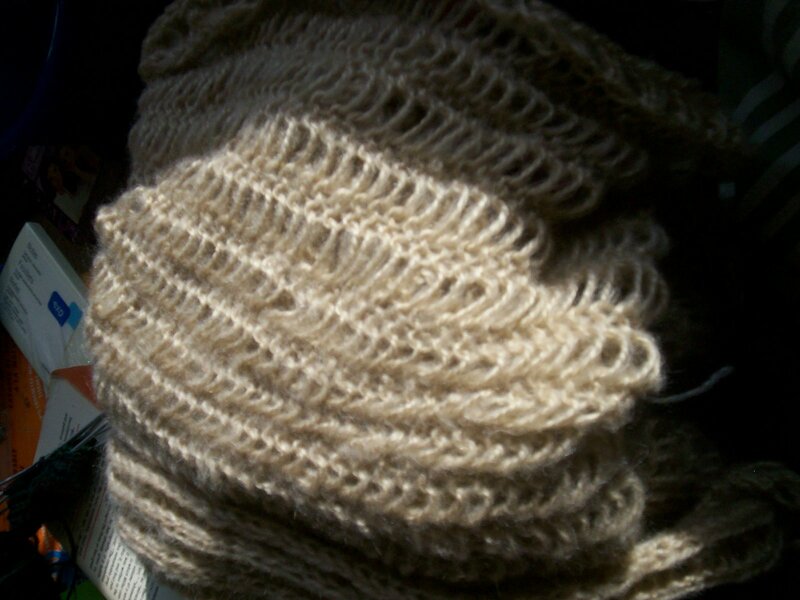 Handspun alpaca and romney turned into a lovely Calorimetry, this was some of the first stuff I spun on my wheel (aka the christmas present of great kniterlyness). Well I’ve been dying, in that lovely “every sickness known to man has befallen me” kind of way. And as soon as i can root out the installer software from moms house I shall hook up the camera and then take pictures for everything. Beware the posts to come, beware i say.